We provide simple, reliable weather forecasts for the UK based on your location and the areas surrounding your location. Computer weather predictions are generally very good these days, but are not (and may never be) able to provide an accurate forecast for your exact location. Many websites attempt to provide very location-specific forecasts and are often innacurate as a result. We take a more pragmatic approach and provide a forecast for a larger area, which we hope is more useful to you. Forecasts on this website are based on data sourced from the Met Office. The data is provided by the Met Office under an Open Government License. Instead of providing the forecast for a single location, we provide a summary of all locations in your region - because they can be suprisingly different. The forecasts provided here are based on data from the Met Office. As one of the top 5 forecast providers in the world, and the only one focussing on the UK, their forecasts are among the best around. However, their forecasts are often different for two adjacent locations. For example, with two locations 2 km apart one might predict rain and the other predict clear skies. Our forecasts provide a summary of all the forecasts near your location because forecasts that change over short distances are clearly unhelpful. The average temperature, wind speed and direction and chance of precipitation forecasts are average values from all locations near the postcode you enter. 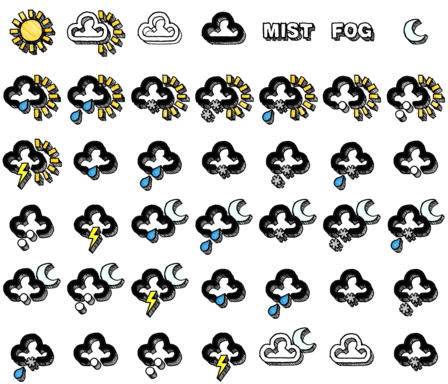 The weather symbols show the "most likely" weather at these nearby locations. If you were to visit another website, you would be shown just one of these symbols. On some days there is not much local variation in the forecast and we will only show one or two symbols, on other days there may be many more (as above). The 'chance of precipitation' forecast gives the chance that some measurable precipitation occurs within the 3-hour time period. It does NOT represent the area that will be covered by precipitation, it also does NOT represent the amount of time that it will rain for. In the above example, 38% means that precipitation would be expected on roughly 1 out of 3 days that have this forecast. Note: A 50% chance of precipitation does not mean forecasters do not know whether it will rain or not. Infact, it rains in about 15% of the time in the UK - so a forecast of 50% means it is much more likely to rain than on a typical day.